To isolate mRNA from total RNA sample, cellulose resin with a poly deoxythimidine oligomer attached (oligo-dT cellulose) is used to purify transcript with a poly-A tail. This purification should be done on the same day as the total RNA purification limit degradation. The total RNA and oligo-dT cellulose are incubated at 65°C and eluted by using elution buffer. 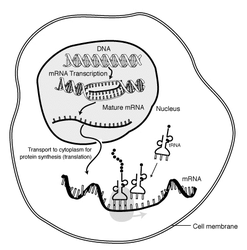 Purified mRNA can be used for Reverse transcription process. The term 'northern blot' actually refers specifically to the capillary transfer of RNA from the electrophoresis gel to the blotting membrane. However, the entire process is commonly referred to as northern blotting. The northern blot technique was developed in 1977 by James Alwine, David Kemp, and George Stark at Stanford University. Northern blotting takes its name from its similarity to the first blotting technique, the Southern blot, named for biologist Edwin Southern. The major difference is that RNA, rather than DNA, is analyzed in the northern blot. Isolation of pure, under graded total RNA from plant tissue can be difficult because of high levels of ribonucleases, pectins and polyphenols that are present in plant material. Another major problem is the presence and removal of proteins. This problem is commonly solved by lysing the plant cells in the presence of phenol/chloroform. Mid-exponential phase bacteria grown in liquid media (50-100µl pellet volume) were harvested by centrifugation at 13500 rpm for 20s in a Microfuge tube, washed in detergent solution. Repelleted and resuspended in RNase free distilled water. Re-extracted with water saturated phenol. Isolated RNA was visualized by Ethidium Bromide Stained Denaturing Formaldehyde gel electrophoresis. Reverse transcription polymerase chain reaction (RT-PCR) is one of many variants of polymerase chain reaction (PCR). 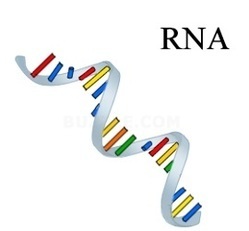 This technique is commonly used in molecular biology to detect RNA expression. In RT-PCR, the RNA template is first converted into a complementary DNA (cDNA) using a reverse transcriptase. The cDNA is then used as a template for exponential amplification using PCR. RT-PCR is currently the most sensitive method of RNA detection available.RT-PCR is used to qualitatively detect gene expression through creation of complementary DNA (cDNA) transcripts from RNA. In vitro transcription is a simple procedure that allows for template-directed synthesis of RNA molecules of any sequence from short oligonucleotides to those of several kilobases in μg to mg quantities. It is based on the engineering of a template that includes a bacteriophage promoter sequence (e.g. from the T7 coliphage) upstream of the sequence of interest followed by transcription using the corresponding RNA polymerase. In vitro transcripts are used in analytical techniques. Northern hybridization is a widely used technique in molecular biology to determine the molecular weight of mRNA and to measure relative amounts of mRNA present in different samples and for identifying alternatively spliced transcripts and multigene family members. Northern Blotting involves separation of RNA samples according to size by agarose gel electrophoresis and detection with hybridization probe complementary to part of or the entire target sequence. Northern Blot refers to capillary transfer of RNA from the electrophoresis gel to the blotting membranes. This protocol uses Trizol (also known as TRI REAGENT) for the isolation of total RNA. Trizol is a mixture of guanidine thioacyanate and phenol, which effectively dissolves DNA, RNA and protein on homogenization or lysis of tissue sample. After adding chloroform and centrifuging, the mixture separates into 3 phases with the upper clear aqueous phase containing the RNA. The next steps in the extraction are washes and precipitation of the RNA. This is a general reaction for pentoses and depends on the formation of furfural when the pentose is heated with concentrated hydrochloric acid. Orcinol reacts with the furfural in the presence of ferric chloride as a catalyst to give a green colour, which can be measured at 665 nm. RNA isolation is difficult procedure .Get rid of R Nases is an essential step with the help of DEPC water. The objective is to isolate a large quantity (perhaps 100 whole micrograms) of high molecular weight, undegraded total RNA. In order to further characterize the mating reaction , will be isolating total RNA from culture contains yeast cells in logarithmic growth phase grown in YPD. 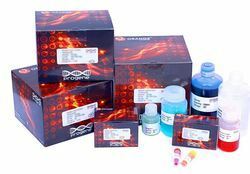 Looking for BIO TECH KIT ?